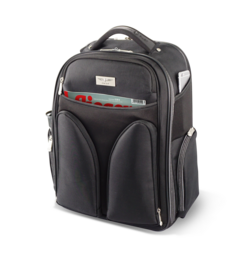 This bag is a marvellous example for the cooperation with our already-existing “PILOTPOOL”. The WEEKEND was specifically designed for pilots and their requirements. You will be amazed by the diversity of this bag. Due to the increasingly higher quality of headsets we have developed a bag that provides even more security for your headset. To prevent the bag from getting dirty, there are small adjustable setting feet on the underside.